Scientists use the fossil record to make judgments on the physiology and behavior of species. But are those interpretations correct? 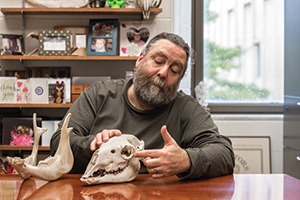 New research from a team of researchers led by Matthew Ravosa, professor of biology and concurrent professor of both aerospace and mechanical engineering and anthropology at the University of Notre Dame, puts into question how we interpret the behavior of extinct organisms from their fossil remains, and the greater role of plasticity — or the adaptive fine-tuning of the link between anatomy and behavior — in determining evolution diversity. The study appears in the journal Biological Reviews and can be found here: http://onlinelibrary.wiley.com/enhanced/doi/10.1111/brv.12199/. Originally published by William G. Gilroy at news.nd.edu on August 17, 2016.